The trial is fully functional, but contains a small number of plants and other objects. A watermark appears on movies and printouts. The full version of the software comes with over 17,000 objects and a shipped package. Designs created using the trial can be seamlessly imported into the full version when it is purchased. 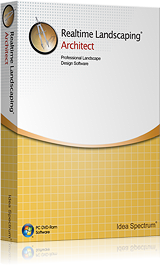 Please note: Designs created in the Architect trial cannot be opened using Realtime Landscaping Pro or Plus. Contact sales@IdeaSpectrum.com to download the Pro or Plus trials.